My wife and I dropped our kids off at my in-laws before the hurricane hit our area. It is much easier to ride out a storm if you only have to take care of yourself. We felt much better with our daughters out of the hurricanes path. Yesterday we made the three hour trip down highway 58 to pick them up. We met my mother-in-law in Clarksville which is next to Kerr Lake. Every time I travel through rural areas I keep my eyes peeled to wildlife. I count deer, turkeys, and hawks to pass the time. As I drove past Occoneechee State Park I was reminded when three years ago I saw a Cougar while driving past this very stretch of road. It was late at night and we were headed to visit my in-laws in Martinsville, Va. The speed limit on 58 right before you hit the bridge over Kerr Lake slows down to 35 mph, so I was slowing down when, out of the corner of my eye, I saw a large animal run across the oncoming lane and into the median. I immediately hit the breaks, not wanting to hit a deer or large dog. As I suspected, the animal ran out in front of our car, had I not slowed down I would have hit it. To my amazement, the animal was not a deer or dog. It was a full grown Mountain Lion! I could not believe my eyes. I am from the west and am familiar with these magnificent cats. Its large body, round head, long tail, and low run gave it away immediately. My wife saw it also, although she could not identify it, other than that it was something she has never seen before. I didn't take this picture (this guy did), but this is what I saw. To say I was excited would be an understatement. 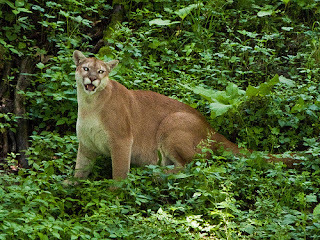 I did not know that there were Cougars in Virginia, but I did know that seeing them anywhere was rare. The next day I told everyone who would listen about it. Everyone reacted the same way; disbelief. I got lots of "are you sure it wasn't a deer" or "maybe you saw a big bobcat." It was very frustrating. With a little research I found out that Mountain Lions are officially extinct in Virginia. While there are dozens of sightings each year in Virginia, none have been officially confirmed. Experts either blame the sightings on misidentifications ("are you sure you didn't see a deer") or on captive Cougars released into the wild. There are hundreds of web sites debating the existence of Cougars in Virginia. Each has many eye witness accounts by sportsmen like myself. The VDGIF is known for dismissing reports of exotic species in Virginia. Most sportsmen around the tidewater area know the occasional alligator makes it up here and that feral hogs are a problem, even though they do not officially exist here. Could Mountain Lions be another example of this? I cannot say how the Mountain Lion I saw got here. It could have been a pet that got loose. It could have been a very rare wild specimen. All I know is what I saw. There is at least one Cougar in Virginia.